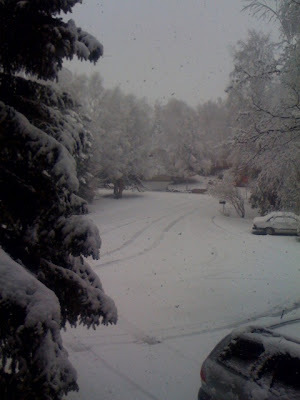 This photo of fresh snow was taken yesterday by my sister-in-law and emailed to me. I feel for you guys! I really do! Christmas and Birthday lists_Some may think them presumptuous and materialistic, but lists really can make life easier for the unimaginative gift giver. The more specific the better. In fact, if you can email the list with attached hyperlinks to Amazon, that would be best. Make sure to offer a range of prices, but don’t be afraid to throw some big-ticket items on there. You never can tell. Somebody we know got a horse. Infamous_The other movie about Truman Capote. We were surprised by the humor and the humanity. Also, we haven’t liked Sandra Bullock this much since While You Were Sleeping. Frying Ramen_Can the delicious twenty-cent meal be improved upon? We submit that it can with a pat of butter, one egg, freshly grated Parmesan and a frying pan. Mmmm. Toning it down_Sometimes you just gotta take a step back and say, “Whoa, I should just tone it the heck down.” Not a bad idea. It has been a very quiet week. Which is good. I’ve been spending a lot of time writing. A lot of time in coffee shops. A little bit of time watching Batman Begins. And a lot of time enjoying the beautiful weather that we’ve been graced with the past several days. Yesterday, after a somewhat distracted afternoon at Café Nero’s, Hannah and Abby and I went for a walk to look at the newly-flowered trees. Check out the new jeans! Jehovah Jireh! New Word Alive in Eleven Bullets. 1. 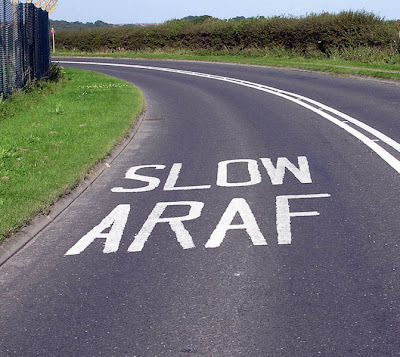 In Welsh, a double “L” (i.e. : LL) is pronounced like a guttural “CH.” Sort of like channukah. So the conference was in Pwllheli. You do the pronunciational math. 2. One of the best definitions of the Trinity: That God exists as three Persons, the Father, Son and Holy Spirit, loving each other. I heard that from Mike Reeves, who gave a three-day lecture series on the Triune God. I really appreciated his seminars. Curious about the Trinity? I’ve got pages of notes! 3. I finally finished the notebook that Daylan gave me for my twenty-fifth birthday! Woo Hoo! Now I can tap into the brand-spankin’ new Molskine that I got for Christmas. 4. I like John Piper even better in person. He spoke for two of the evening sessions on the topic of suffering using Romans 8. “The meaning of all misery is that sin is horrific.” Very challenging. 5. D.A. Carson, who I had never heard preach, reminds me a little of my old business prof, Dr. Mackey. He walked us through 1 John (which I call “First John” and everyone else over here calls “One John”) during four of the morning sessions. Great stuff along the lines of “I’m a Christian, but I sin.” How do we as believers deal with the dichotomy of both the light and the darkness in our lives? Answer: You must not walk in the darkness. And praise the Lord for his grace. Curious about 1 John? I’ve got pages of notes! 6. Stuart Townend is alive. Who knew? Well, most people probably do, but I kind of had him in the John Wesley/Charles Spurgeon generation. The first time I had heard of him was my last year at Master’s when we started singing “How Deep the Father’s Love for Us.” I always thought it was like an old Irish ballad for some reason. Ah well. He’s alive and kicking and led some rock-awesome worship sessions. 7. You don’t necessarily have to wash soapy water off dishes when you’ve washed them. Some do, some don’t. It’s very freeing. 9. Jo Mango is a female Scottish folksinger. Not, as initially thought, a male Caribbean-cruise lounge singer. 10. I go to church with some very cool people. 11. In general, it was just wonderful to be around people who believe in the Father’s plan, the Son’s saving work, and the Spirit’s sustaining power. It was refreshing to sing with thousands of other voices and to be reminded that this world is fleeting. I’m so encouraged that God created us for relationship and then gave us the Church. So that was my week. I am now back in Bath and happy to be here, hanging out with good friends from the MA and writing my little fingers to the bone. Just practicing my cockney accent, which I have been informed needs a little work. Okay, so this isn't really a post. I'm just back from an incredible week in Pwllheli, Wales with a group from my church. We attended the New Word Alive, an evangelical conference. Did I say evangelical? I meant magical. No. Actually I did mean evangelical. But it was great. I have a stack of work to do for Monday. A stack of laundry to do for tomorrow. And that novel ain't getting written by itself. So, stay tuned, dear readers, for some posts about the trip and about the week and also I have some "tags" to catch up on (more on that later). Also, my blogroll needs updating. I'm still toying with the move to WordPress. I haven't hoovered (vaccummed) in about a month. And I still haven't dealt with that tomato. About two months ago I sliced a tomato in half. One half was used to add color, flavor, and valuable nutrients to a sandwich. The other was deposited in a small Tupperware container, stuck in the door of my fridge and promptly forgotten. A few weeks ago, while reaching for my block of Parmesan cheese, I was reacquainted with the existence of this half-a-tomato, if it can still be called that. I didn't take a close look. I know that it can't be pretty. I also know that eventually I will have to pull the small Tupperware out of the door of my refrigerator and deal with the now-putrid food product therein. But for some reason I'm putting it off. I can't really explain why. I know that I can't win. From Alaska to Ohio in ten words or less.